Marc Overmars is still the Dutchman having the highest transfer fee paid for. In summer 2000 he moved from Arsenal to Barcelona for the record fee of 40 million Euro. He played for three seasons in England and four seasons in Spain. His most successful seasons were at Ajax when he won the Championships and the Champions League (in 1995). 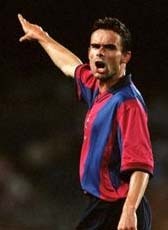 Overmars retired in July 2004 because of having chronicle problems with his right-knee. However after four years, he decided to take his boots again and started to play for his old club Go Ahead Eagles in August 2008. During his second fare-well season (2008-09), he tried to make some impact and give the club a boost. However his weak condition made his return a small failure. In his final home match against TOP Oss, he was kicked out of the match by a dangerous sliding just a minute after entering the match.